Thanks! 1/8"ish. Thicker than nessmuk's but about as thin as i like my outdoor fixed blades. Very nice knife. Thanks for the picture. Thank you. It has led to me getting on the waiting list for two more knives from Matt. He is a true craftsman in my opinion. That is a real beauty! I wonder why Matt has never graced us with his presence? Seems to be pretty hooked up. His wait list is a year or so now. Wish he would though. He makes some great knives! That's really nice! Great handle material, too. Thank you. 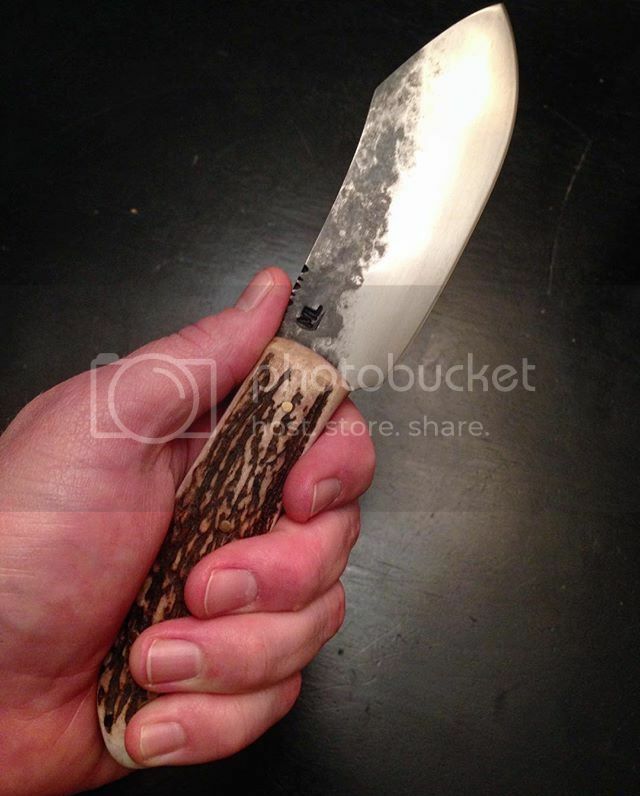 Matt selected a really great piece of antler for this! should be a great working knife. I processed out a brisket with it the other day. Works quite well. Will be a great knife to take on the hunt. Is there a website I can look at? I'm probably the only one who doesn't know who Matt is lol. Of course. Here ya go!